Some designs stand out from the crowd with their loud colors and flashy finishings, but this contemporary abode takes a different approach. 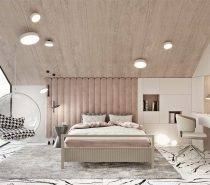 Designer and visualizer, Tolko Interiors, did an amazing job creating a unique apartment that is both elegant and stylish. This 140 sqm. 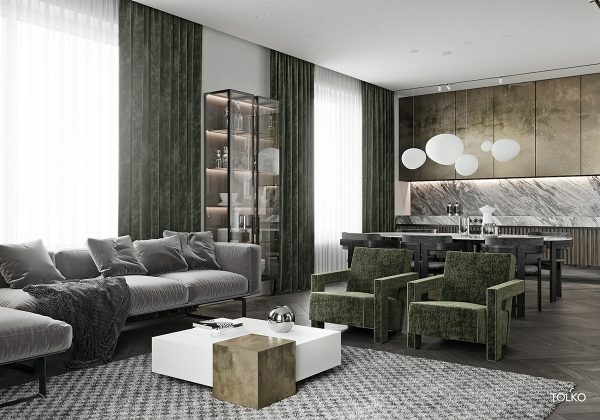 home located in Moscow, Russia is encapsulated by neutrals and adorned with accents of moss green, gold, and marble. There is nothing quite like it! We were especially blown away by the playful turn of décor in the kid’s bedroom, with a full section dedicated to an indoor jungle gym. 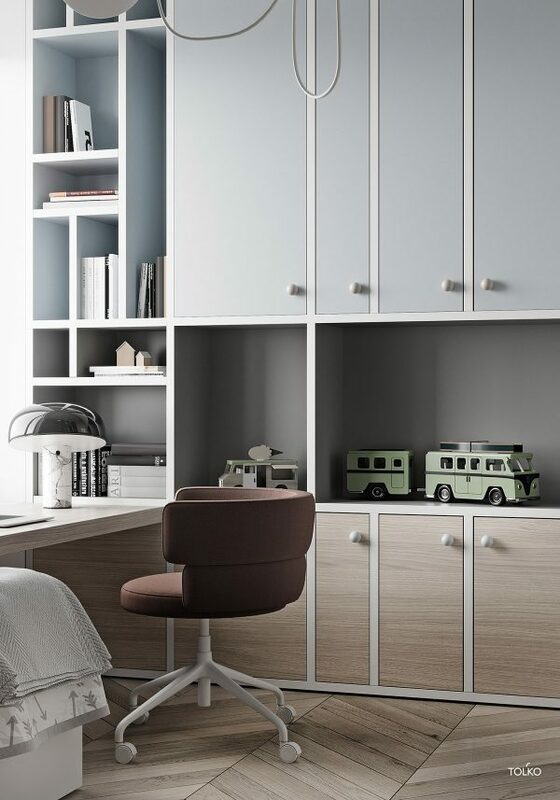 It isn’t every day that you see a neutrally colored kid’s room look so energetic and enticing! Washed in a flood of natural light, this living room has a rich color palette filled with an array of neutral and unsaturated hues. This project was named the “Oregano Flat” due to the accents of deep and dark oregano green that you will see throughout this home. In this room, the deep green really contrasts against the unique coffee table with its gold and white glossy finish. 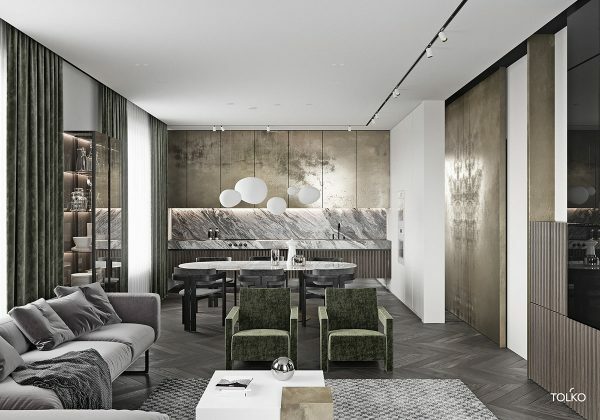 The same gold finish on the coffee table is carried throughout this open-concept layout to highlight both the cupboards and the walls. 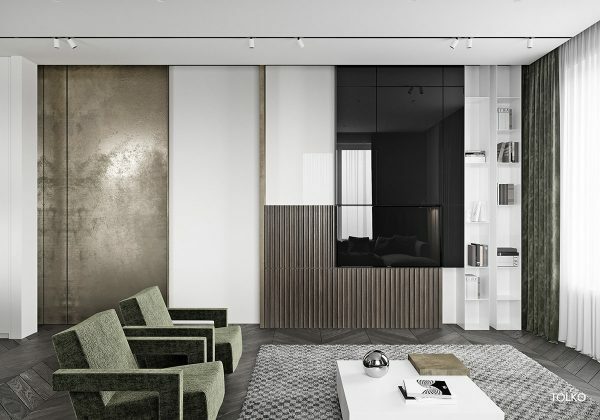 This apartment measures 140 sqm., so the use of an open-concept living room/eat-in kitchen really helps maximize the space. A view of the living room and all its oregano green goodness. We see that this color has been used on both the ceiling-to-floor curtains, as well as the two accent chairs in the seating area. 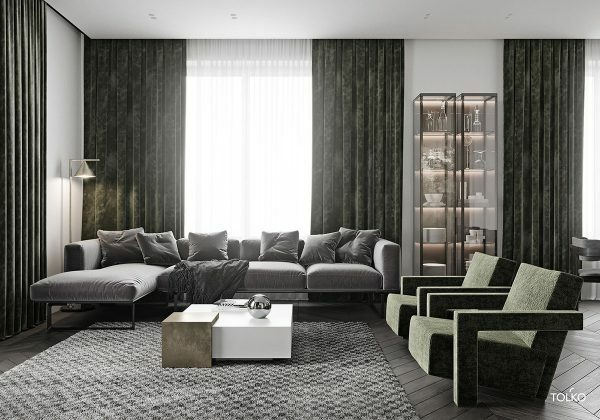 The combo of both sheer and heavy curtains is quite the dynamic duo in this room, with the sheer curtains making sure that natural light is fully utilized and the heavy green curtains adding a dramatic flair. 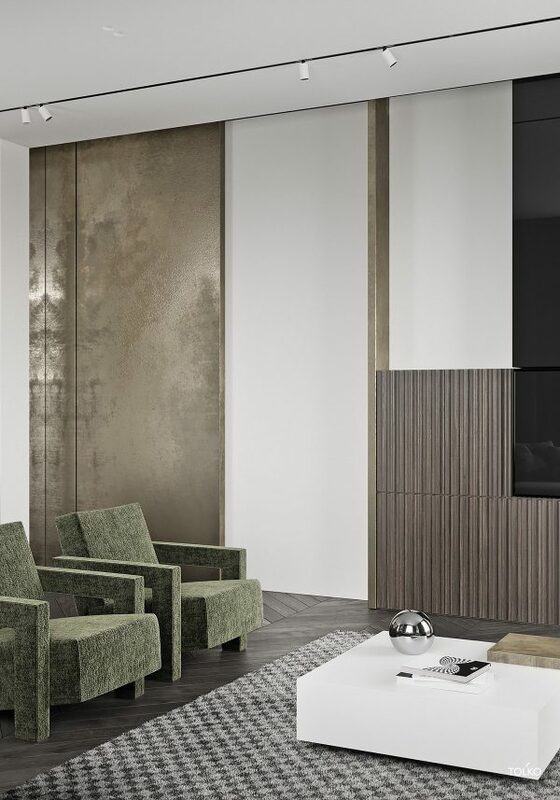 The gold, green, and brown color palette chosen for this space feels rich and earthy. 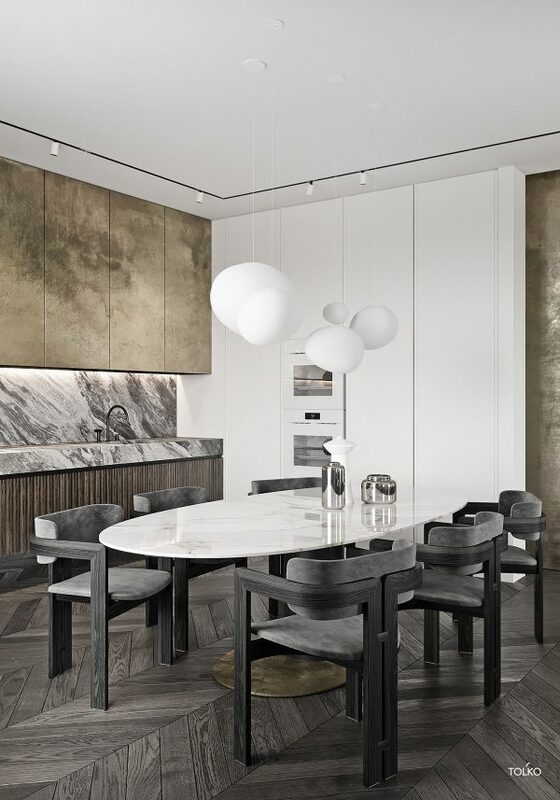 We can clearly see that the designers took a page out of Mother Nature’s design book with the textured accent chairs reminiscent of moss and the wooden accents used throughout the home. 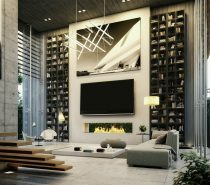 This living room perfectly demonstrates that patterns don’t always need to be big and bold to make an impact. 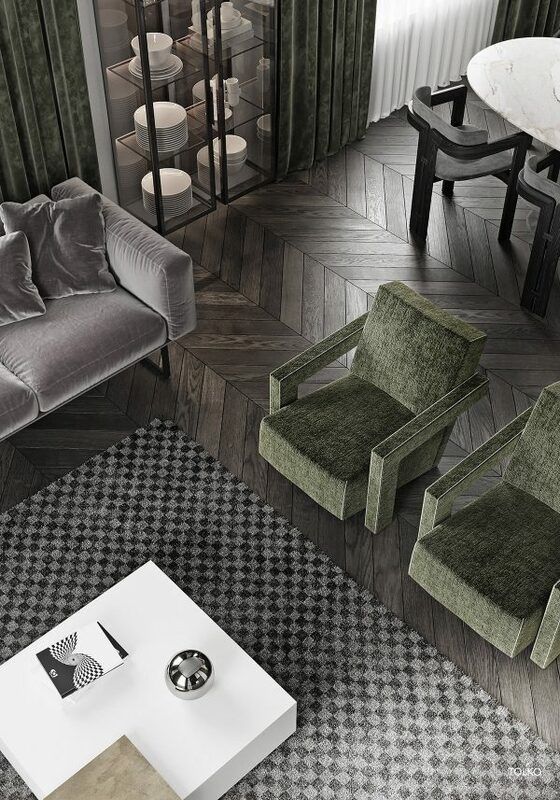 The herringbone patterned wood floors and checkered rug add visual interest to this room and undoubtedly enhances the rest of its features. 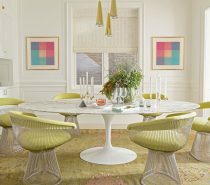 With the use of mainly neutrals, varying shades, patterns, and texture is vital to create a design that doesn’t feel monotonous. In this corner, we find a small, white built-in bookcase wedged between the unique fireplace and large windows. Custom shelving is always a great way to ensure that you are maximizing the amount of space you have by creating a perfect fit. Floor-to-ceiling shelving is also a wonderful idea since it can help a room feel taller, which in turn makes it feel more spacious. A small eat-in kitchen equipped with a marble dining table and seating for 6. This room is perfect for a double date or an intimate get together among friends. Just look how cozy it is! 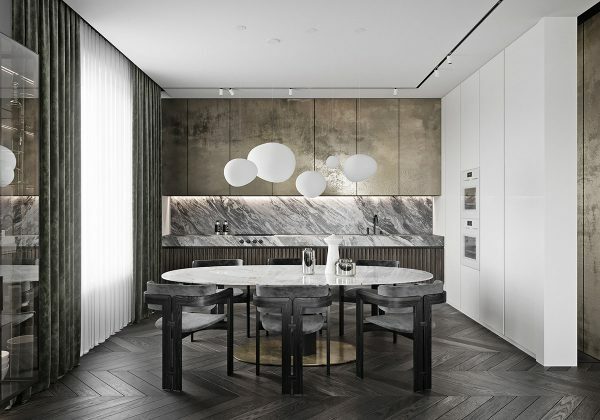 The unique dining room pendant lights in this eat-in kitchen are hard to miss. Their round design and uneven spacing make them a fun, yet elegant lighting choice for this contemporary space. 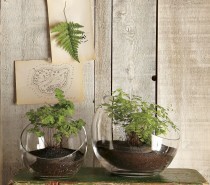 The kitchen table is complete with a mix of decorative vases and containers. The use of both clear and opaque table decor was a divine choice that helps keep things interesting. 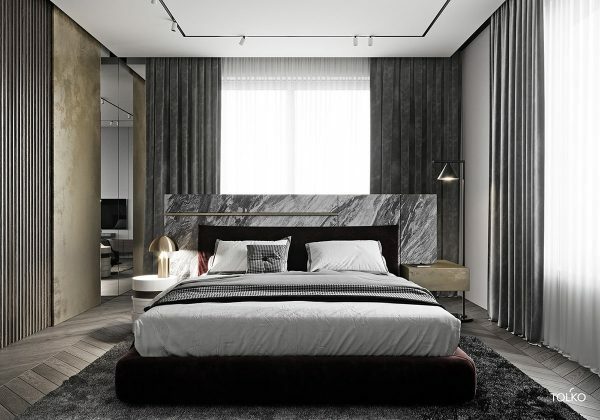 A peek in to the bedroom and we find the same color palette along with a gold designer table lamp and marble headboard. The lamp seen on the left is called an Atollo lamp and can come with quite the steep price tag. 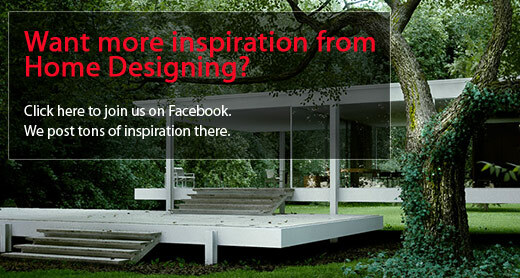 However, those who love the look but are on a tighter budget can find cheaper replicas on Ebay. 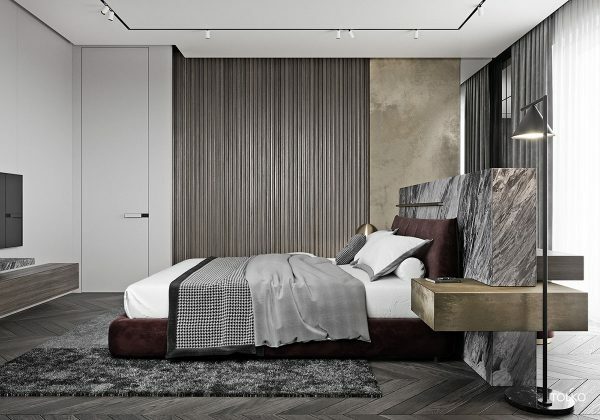 The low platform bed with its custom headboard and gold side table becomes the centerpiece of this bedroom. The plush rug and neutral coloring makes it extra cozy and perfect for lazy Sundays in bed or snuggling up with a good book. Standing proudly beside the built-in end table is a simple and chic floor lamp. 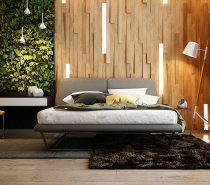 Floor lamps or wall sconces are a great option for those who need extra lighting in the bedroom, but don’t want to give up valuable end table space. 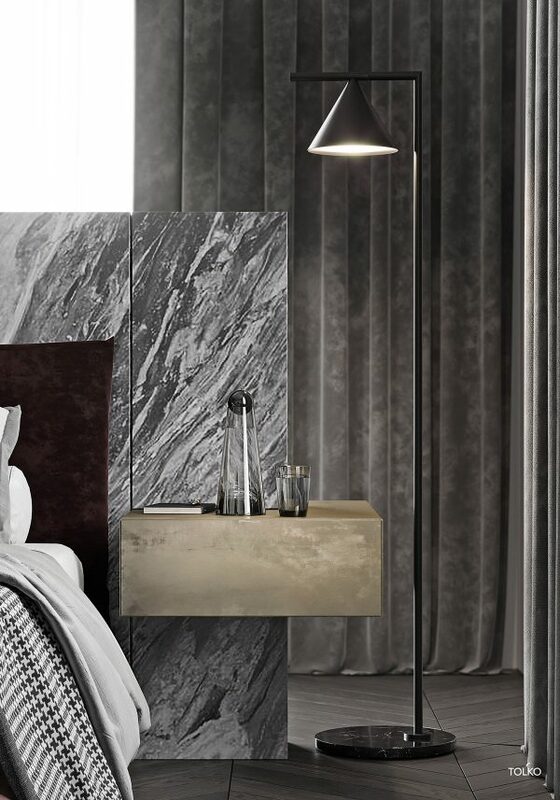 A floating marble shelf that seamlessly matches the custom headboard hovers below a mounted flatscreen TV. 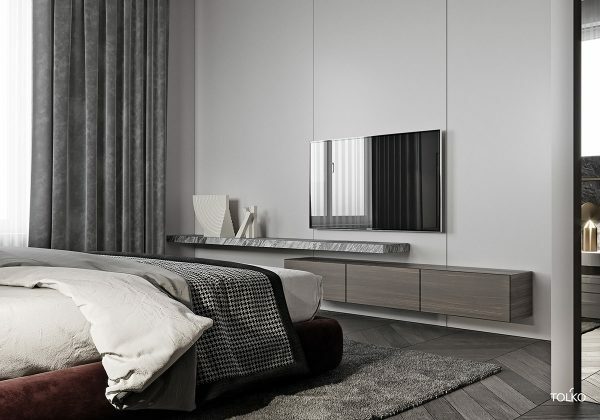 This bedroom has also decided to forgo a regular dresser and has instead traded it for a stylish floating cabinet. In case this bed couldn’t get any cooler, it turns out that the backside is equipped with a full makeup vanity! A makeup vanity just steps away from a cozy bed? Yes, please! 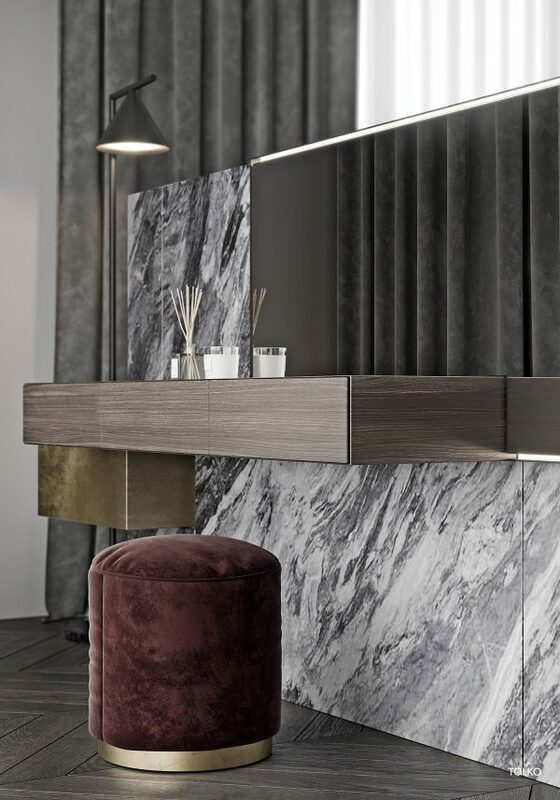 A close-up gives us a better look at the velour vanity stool. You might of noticed that the same fabric has been used to upholster the bed frame. 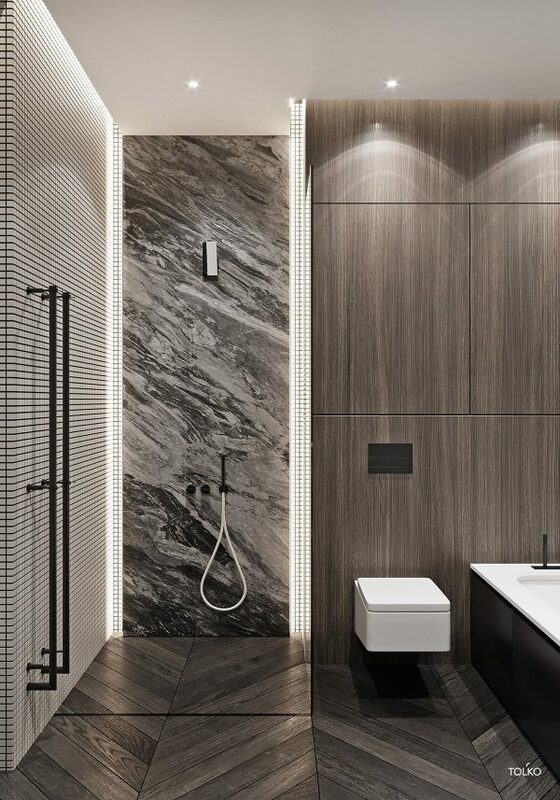 A glass shower keeps things fresh and open in this luxury bathroom. 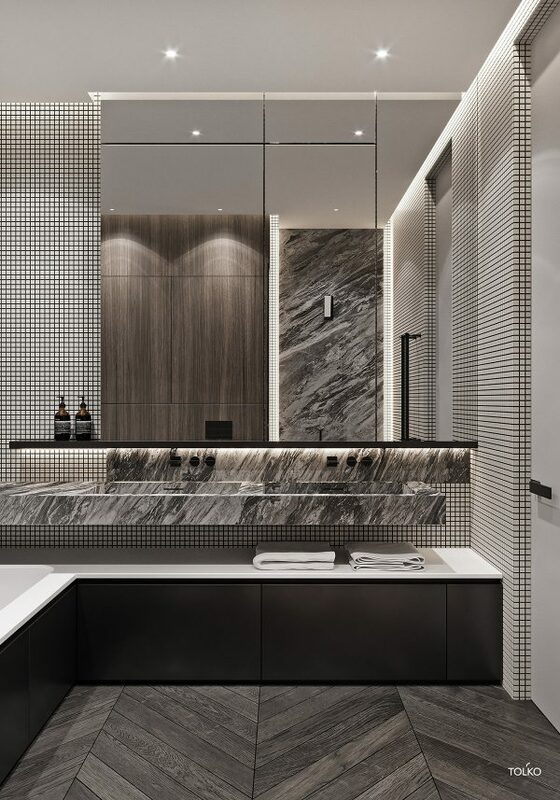 This flat has a really uniform look thanks to elements like the black and white marble and herringbone flooring being carried from room to room. A double sink with a unique configuration. Instead of sitting directly atop the vanity cupboard, like the majority of counters, this one floats a foot above it. This leaves plenty of room to display bathroom pretties like folded towels, bath products or candles. 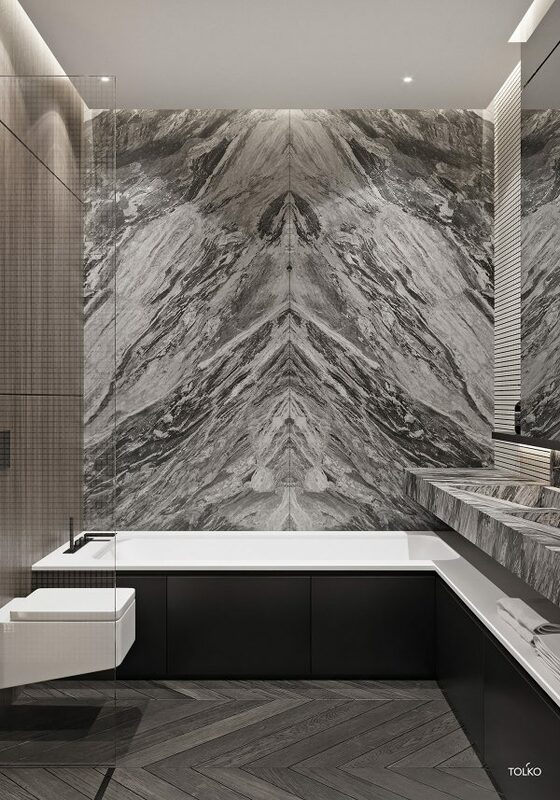 To complete the luxury bathroom experience, this corner has been fitted with a large soaker tub. 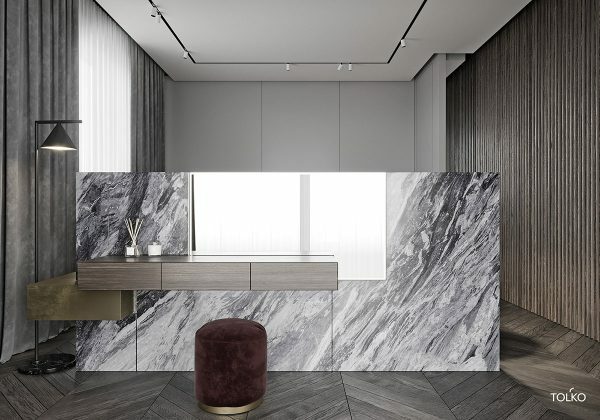 The side has been paneled with the same material as the cabinets to create a flow of dark brown that contrasts beautifully against the white counter and other light finishings. This bedroom is brimming with Scandinavian charm! 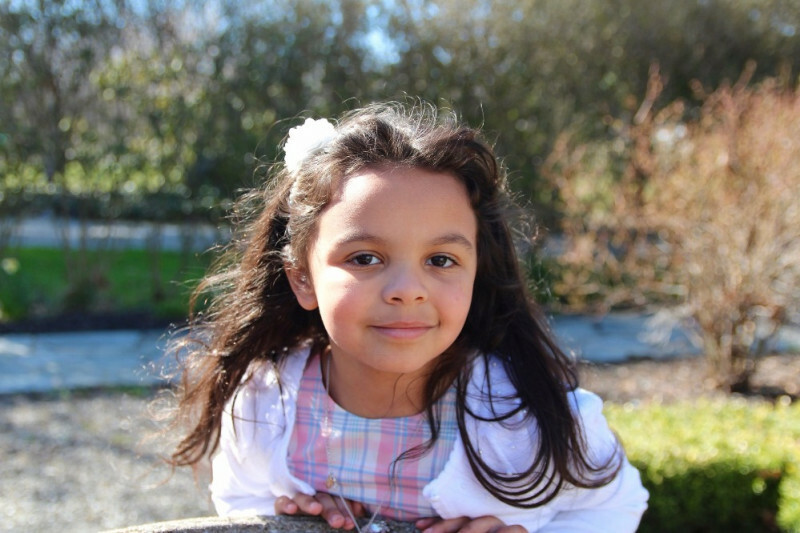 Everything from the kid’s study space to the ride-on airplane is pure perfection. A swivel chair and Flos Snoopy lamp help create the perfect workspace for getting a bit of homework done. One of our personal favorite features of this room is the whole wall of built-ins. 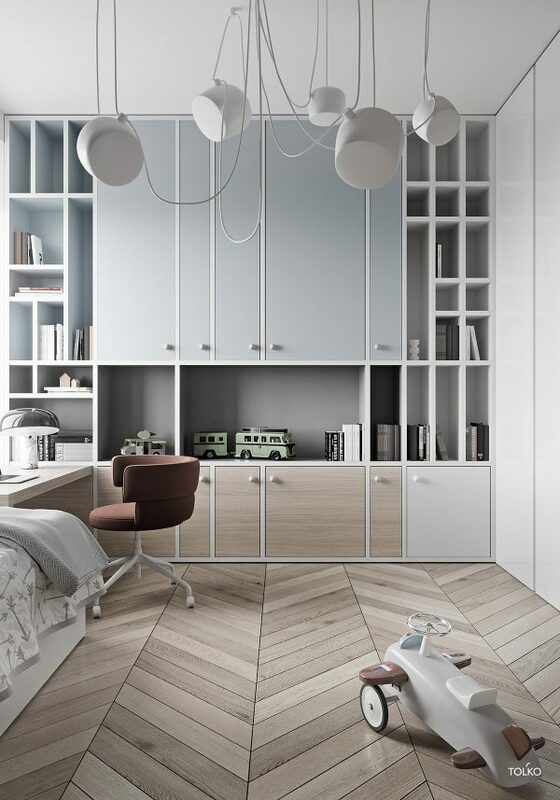 Having that much storage undoubtedly contributes to this bedroom’s clean and uncluttered aesthetic. 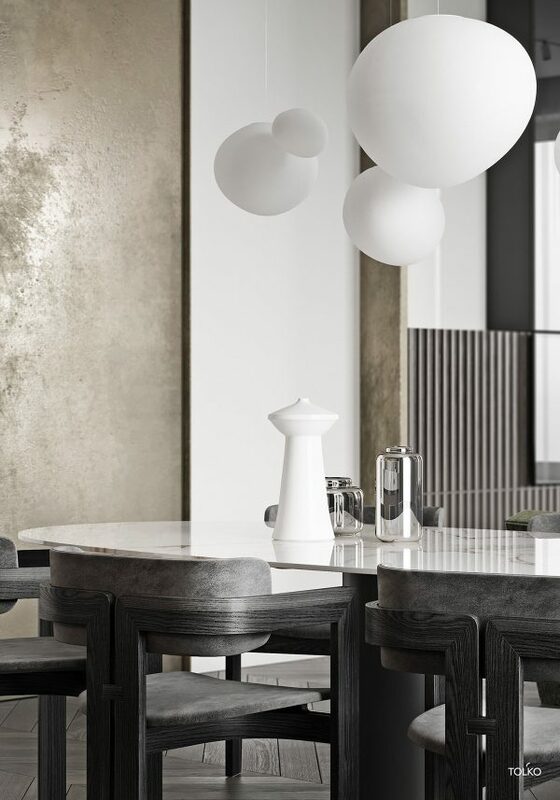 The AIM pendant light draped from the ceiling is a tangle of modern charm and youthful style. 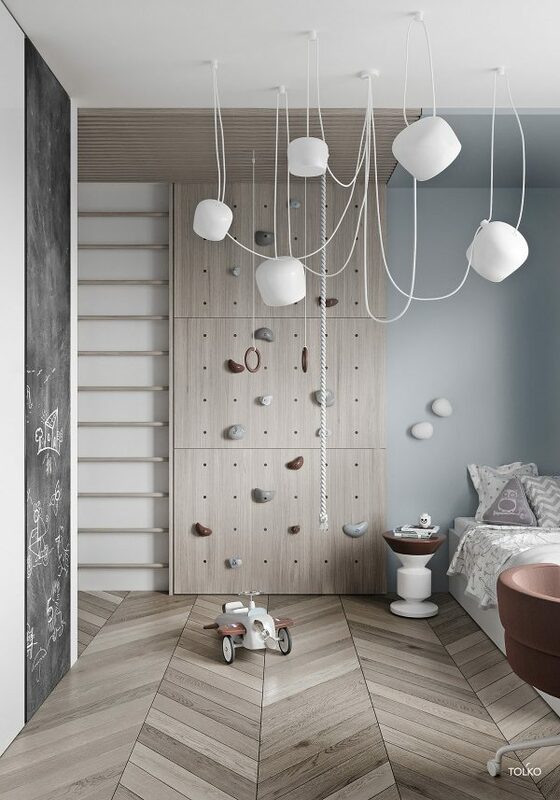 A wonderful lighting option for rooms that are looking to incorporate more playfulness in to their design. This bedroom knows how to do kid’s decor in a big way. Let’s be honest, what child wouldn’t love their own personal climbing wall? Plus, there is also a swinging rope and rings hanging from the ceiling. It’s like having your own personal park! For when the little one is all tucked out from play, a cozy single bed is situated in the corner. This space goes a bit more playful with its pattern and opts for arrow and chevron bedding. No bedroom would be complete without a side table. This design uses a small side table to store a few books and a Lego toy. 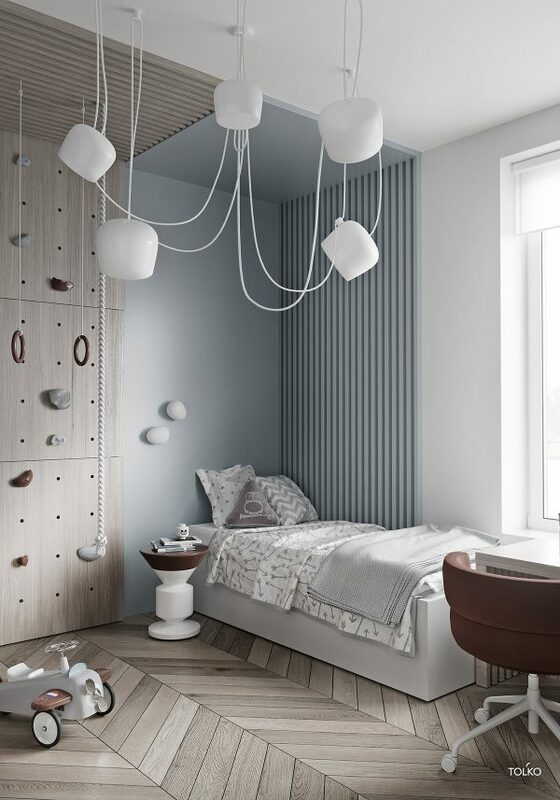 Its white and brown coloring and fun shape seamlessly blend in to the aesthetic of this awesome kid’s bedroom.